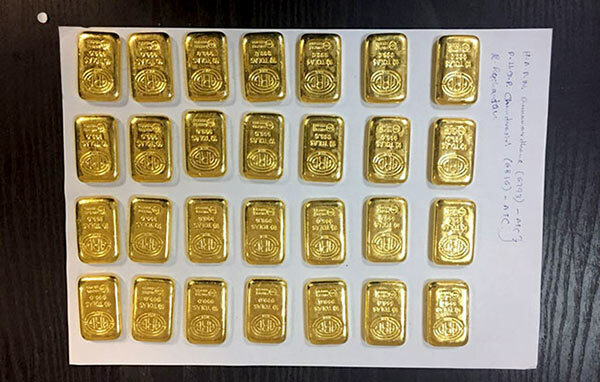 A parcel containing 28 gold biscuits worth almost Rs 20 million has been found behind a water dispenser at the Bandaranaike International Airport (BIA) by an employee of a Duty Free shop. The gold biscuits, each weighing 116g, had been packed in two empty cigarette packets. The employee had handed over the parcel to the Customs Office at Departure of the airport. The parcel had been found behind a water dispenser according to him. The 28 gold biscuits weighing 3.248kg in total have been valued at Rs 19,592,160. The gold biscuits were detained for further investigations, Sri Lanka Customs said.